When the Special Boat Service need to rapidly deploy Rigid Inflatable Boats (RIBs), one method they use is to have them dropped out the back of a Royal Air Force (RAF) C-130J Hercules. In so-called 'boat drop' or 'boat airdrop' operations, a RIB or other small boat is mounted on a special platform. This load is then placed inside the rear cargo bay of a compatible transport aircraft. Aircraft used in boat drops are typically C-130J Hercules from RAF 47 Squadron, flown by Special Forces Flight crews. RAF C-17A Globemaster and A400M Atlas aircraft both have compatible cargo handling systems. When at release point, a drogue parachute is deployed, which pulls the load out, over the aircraft's rear ramp. During descent the boat separates from the platform and both descend under their own set of parachutes. The platform can be configured to float and be recovered (used during training) or to sink without trace (used on operations). 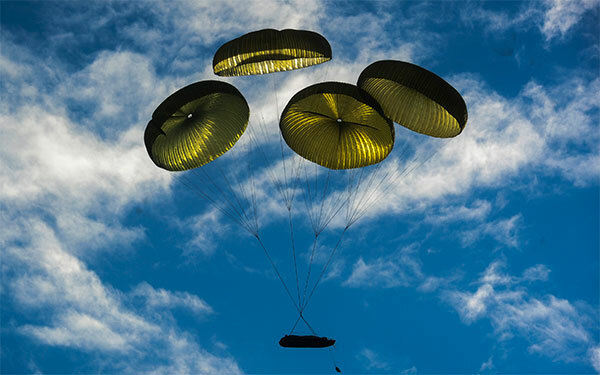 The boat's crew and passengers (typically Royal Marines Special Forces Boat Operator (SFBO) coxswains and SBS troops) follow the load out under their own chutes, landing close to the boat, which they proceed to board and make ready for operation. The boat drop loads are prepared, loaded and deployed by crews from 47 Air Despatch Squadron of the Royal Logisitics Corps (47 AD Sqn RLC). The United Kingdom is a world leader in the boat drop business. Systems developed by UK companies are in use with maritime special operations units around the world. Once such system is the Maritime Craft Aerial Delivery System (MCADS) (pictured in action below). Developed by Airborne Systems of Bridgend, Wales. MCADS operators include the UK, the US, Australia, France and Norway. 2 US aircraft airdrop RIBs via MCADS. Visible here are the extractor chutes that deploy and pull the boat/platform load out of the aircraft. 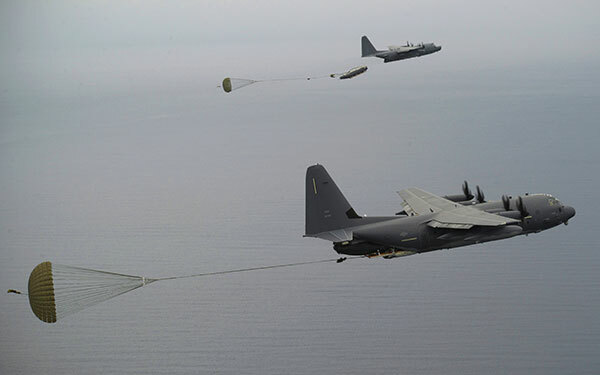 A United States Air Force MC-130J Commando II aircraft performs a boat drop operation using MCADS. In this shot, the boat and platform are still connected. Moments later they will seperate and deploy their own chutes. Once separated from the platform, the RIB descends to the water under its own set of parachutes. The MCADS uses PRIBAD 21 (Platform, Rigid Inflatable Boat Aerial Delivery 21 ft) and PURIBAD (Platform Universal, Rigid Inflatable Boat Aerial Delivery) platforms. According to marketing materials, it is the only in-service system capable of dropping 'large' RIBs. In 2011, versions of the MCADS configured to drop boats of 6.5m to 8.5m in length from UK C-130J aircraft were delivered to the MoD.